As you probably know, Percona Server for MySQL’s binlog contains sensitive information. Replication uses the binlog to copy events between servers. They contain all the information from one server so that it can be applied on another. In other words, if somebody has access to a binlog, it means they have access to all the data in the server. Moreover, said person (or, “Hacker”) could create a clone copy of our server by just making a replica of it. In the end, they have access to our binlog. This shows how important protecting a binlog really is – leakage of binlogs not only make a particular table/tablespace or a group of tables accessible to a hacker, but literally the whole server is at risk. The same situation is true with relay log – a relay log is really a copy of binlog on the slave server. But have no fear – a new feature to the rescue – binary log encryption. Since Percona Server for MySQL version 5.7.20-19 (beta version) it is possible to enable binlog encryption for all the binlogs and relay logs produced by the server. To start binlog encryption, you need to start the server with –encrypt-binlog=1. This, in turn, requires –master_verify_checksum and –binlog_checksum both to be ON. Also, you need to install one of the keyring plugins. From now on all the binlogs and relay logs produced by the server get encrypted. However, for the replication to be safe as a whole the connection between servers also has to be encrypted. See https://dev.mysql.com/doc/refman/5.7/en/replication-solutions-encrypted-connections.html for details on how to do this. Please note that this does not mean that all binlogs in our replication schema get encrypted. Remember you need to turn on encrypt-binlog on slave servers too, even if they do not produce binlog files. Slave servers still produce relay logs when replicating from a master server. Turn on encrypt-binlog on slave servers so that their relay logs also get encrypted. How does this work in the big picture? The master encrypts the event before writing it into the binlog. The slave connects to master and ask for events. The master decrypts the events from the binary log and sends them over to slave. 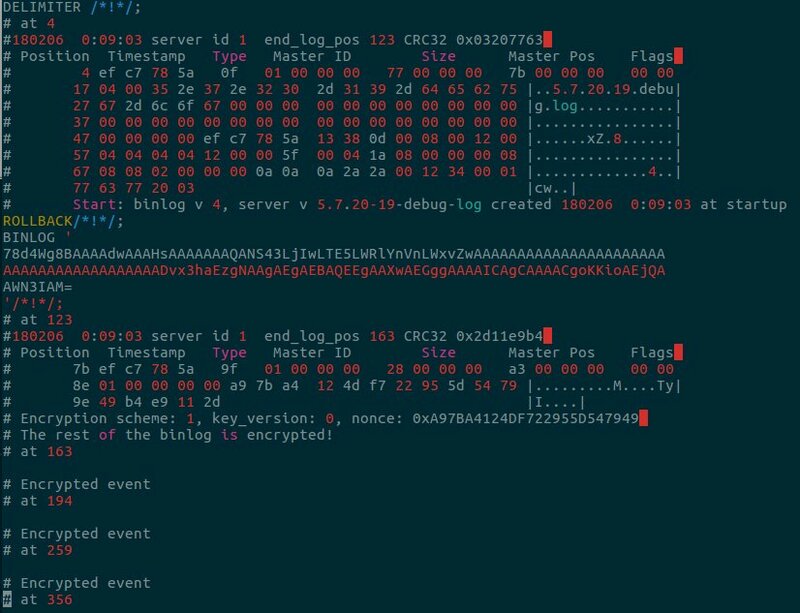 Note that events send between the master and slave servers are not encrypted! This is why the connection between the master and slave needs to use a secure channel, i.e., TLS. The slave receives events from the master, encrypts them and writes them down into the relay log. That is why we need to enable encrypt-binlog on a slave. The relay log has to get encrypted too. Next, the slave decrypts events from relay log and applies them. After applying the event the slave encrypts it and writes it down into its binlog file (given binlog is enabled on the slave). The connection between master and slave needs to use TLS. It’s worth noting that servers in replication have no idea if other servers are encrypted or not. Why do master_verify_checksum and binlog_checksum need to be turned ON? This is needed for “authenticate encryption”. Simply put, this is how we make sure that what we decrypt has not been changed by a third party. Also, it checks if the key that was used to decrypt the event was the correct one. 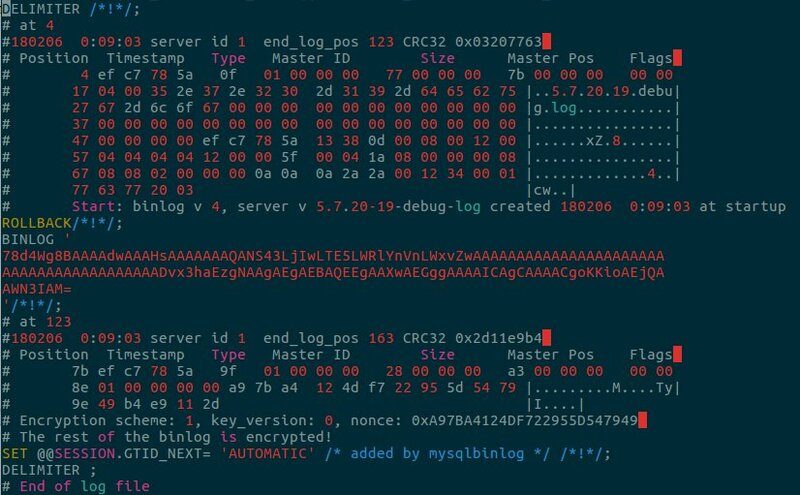 Mysqlbinlog is a standalone application that lets you read binlog files. As I write this blog post, it is not capable of decrypting binary logs – at least not by itself. However, it still can read encrypted binlog files when using a running Percona Server for MySQL. Use option –read-from-remote-server to read binary log produced by a given server. As you can see it is only possible to read binary log till event type 9f gets read. This event is the Start_encryption_event. After this event the rest of the binlog is encrypted. One thing to note is that Start_encryption_event is never propagated in replication. For instance, the master server is run with –encryt_binlog. This means that the server writes Start_encryption_event to its binary logs. However it is never sent to the slave server (the slave has no idea whether the master is encrypted). As you can see, it is only possible to read two first events – until the Start_encryption_event. However, this time we can see that there are other events that follow, which are encrypted. 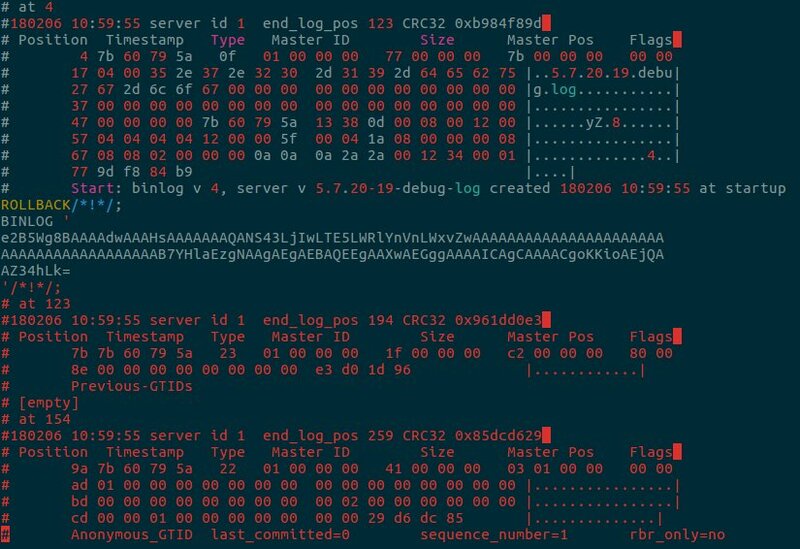 Running mysqlbinlog (without –read-from-remote) on encrypted binary logs may only make sense if we want to see if a given binary log is encrypted. For point-in-time recovery, and for other purposes that might require reading encrypted binlog, we would use mysqlbinlog with –read-from-remote option. mysqlbinlog –read-from-remote-server –protocol=tcp –host=127.0.0.1 –port=3033 –user=robert –password=hard_password master-bing.000001. You can now see the decrypted binlog. One interesting thing to note here is that we do not see our Start_encryption_event (type 9f). This proves my point – Start_encryption_event never leaves the server (we are reading from the server now as we use –read-from-remote-server). For more information how to use mysqlbinlog for point-in-time recovery see https://dev.mysql.com/doc/refman/5.7/en/point-in-time-recovery.html. Have fun with binlog encryption!